At some locations it is already cheaper than coal. Nevertheless, further improvements are needed. Can we make wind energy more accessible to a larger community? One billion people still have no or only little access to electricity. How can they be provided with electricity with low impact on the climate and on the environment? Wind Energy is one of the fastest growing energy sources of the world. At some locations it is already cheaper than coal. Nevertheless, further improvements are needed. Can we make wind energy more accessible to a larger community? One billion people still have no or only little access to electricity. How can they be provided with electricity with low impact on the climate and on the environment? Airborne Wind Energy (AWE) is the answer. We make it happen! The way we generate electricity is to use a flying wing, attached to a tether. At the ground, the tether is turning a drum that is operating a generator. This set­ up does not require a tower, does not require cranes and has the possibility to be operated at twice as many locations when compared to conventional wind turbines. Furthermore, airborne wind energy will be significantly cheaper and operates night and day. We make it happen! The way we generate electricity is to use a flying wing, attached to a tether. At the ground, the tether is turning a drum that is operating a generator. This set­ up does not require a tower, does not require cranes and has the possibility to be operated at twice as many locations when compared to conventional wind turbines. Furthermore, airborne wind energy will be significantly cheaper and operates night and day. We offer a variety of solutions. 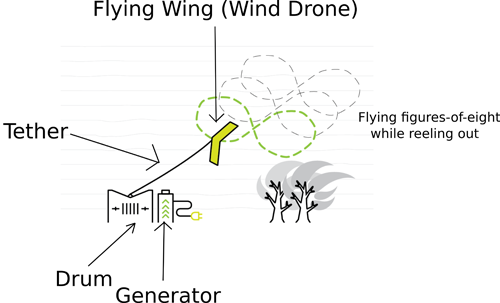 Products / Fast and reliable wireless link makes it possible to use ground based sensors for the control of wind drones. Products / Flight control system fills the gap between small and cheap drone controllers and large and expensive commercial flight control computers. Services / Studies on performance and costs of airborne wind energy. Services / Development of control software. Services / Advice on the implementation of energy storage systems for wind energy. Our vision is to deploy thousands of small scale wind drones initially in Europe, Africa and India. In Europe they will be used mainly for recreational purposes, while in Africa and India they will boost economical development in rural communities. To accelerate the ascent of airborne wind energy we are providing services and products which are needed by many airborne wind system manufacturers. Soon we will develop the smallest wind drone of the world for recreation and rural electrification.